Beachwood Golf Course is one of the oldest golf courses in North Myrtle Beach, nestled between the Intracoastal Waterway and Highway 17. Built in 1968, Beachwood has a reputation for being one of the best maintain golf courses on the Grand Strand and home to various prominent South Carolina golf events. Gene Hamm as the golf course architect designed this layout for all skill sets. Enjoy a challenging game of golf and marvel at the natural vegetation, boats that cruise on the Intracoastal Waterway, and the spectacular Atlantic Ocean. Unlike many other Myrtle Beach golf courses, Beachwood offers golfers winding fairways with multicolored floras, towering Carolina pines, clear lakes, and Bermuda greens. Hamm’s flawless course design provides enough challenge for both beginner and experienced golfers alike, and can only be experienced when you golf in South Carolina. When it is time to relax after a day of golf, quench your thirst at Beachwood Grill. Great food for every palate is prepared at the Beachwood Grill, where early golfers can feast on a full breakfast menu. This course also allows golfers to take personal coolers to the course, as long as the coolers fit into the golf cart basket. 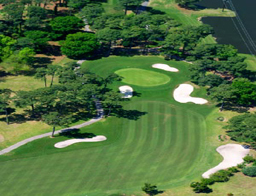 Beachwood is not just for you and your golf buddies, but enjoyable for a family golf vacation. Enjoy a round of golf with your family, grab a bite to eat, and together enjoy nature’s splendor and the weather in Myrtle Beach. Golf vacation packages are available that include North Myrtle Beach rentals as well as nearby Myrtle Beach hotels. Golf Myrtle Beach! You are only a click away from an array of golf packages to suit any budget. Overpriced for the quality of the golf (we paid a $61 afternoon midweek rate). Kids only get a discount rate of $25, which is too much when so many quality courses offer a free play with paying adult. The staff acted like they were doing you a favor when they were checking you in although the starter was pleasant enough. Place is in great shape. A couple of tee boxes are ruff, but greens are great. Course was in great shape from tee to green. Staff kept play at an acceptable pace without being pushy. I would call this a high handicappers course - wide open without any overly difficult holes. Water comes into play at a few holes and almost not at all for those using forward tees. I'll be bringing my wife to play this course very soon. Just heard rumor that this course is up for sale. Not sure if its true or not. Will wait to see. In the meantime i may have to look for another to play. Course was in great shape from tee to green. Staff kept play at an acceptable pace without being pushy. I would call this a high handicappers course - wide open without any overly difficult holes. Water comes into play at a few holes and almost not at all for those using forward tees. I'll be bringing my wife to play this course very soon. Friendly course. Great staff. Fast play. Good shape. Lots of fun. Will play again. Nice course. Staff friendly and nice seating area after your round. Pretty much wide open eith some tough approaches and not much water. Greens were in great shape. Fairways good and wet in some areas but that is expected with the rain we've had the past couple weeks. We thought that layout was fun and offered just enough of a challenge. Overall conditions were good as was the pace of play. 4 hour round. Hope to return at some future date. Good value for the buck. Would recommend it. The course itself was good. Greens and fairways in good condition. Thet could use some sprucing up of the clubhouse and grounds themselves. Overall though the golfing was good. Oh, scorecards hole layouts did not match reality for some reason. Played here today for the 1st time. Nice course, friendly staff. I thought it was a good challenge and the course was in good shape. Looking forward to a return trip soon. I plan on recommending it to my Surfside Beach church golf group coordinator to put it on his list so our group of 16 or so can go there. Fantastic golfing experience!! I played here the 1st time I visited Myrtle Beach almost 15 years ago and glad they're still there!! Old school feel with an exceptional staff!! Michael in the Pro shop was extremely hospitable and accommodating!! Great pricing and fast electric cars make this one a must play spot! Course seems to have been somewhat affected by winter kill, as there are some areas of a few greens which are still having difficulty growing back. However, not nearly as bad as some of the surrounding courses in the area. The layout is simple and straightforward, and the greens were in pretty good shape and fairly responsive to spin. Overall a solid public course. Would play again. I thought this was a good course and moderately challenging for my higher handicap. I started off on this course in the early morning about an hour after a heavy rain went through, and as expected, the course was quite soggy. This is not the course's fault, but it was a little challenging with the water on the fairways. As the morning wore on and the sun broke through, the fairways tightened up and play was more manageable. The course overall was in good shape, but as others stated, the greens were fair. The price was good. The staff was very courteous including the starter taking your bag from your car and securing in the cart. The pace of play was good and the course traffic was as expected. Practice green, chipping green, and range were all good. I recommend this course. Fisrt of all staff is good no problems at all. Now the course is okay but pretty much just up and back. Open fairways so would be good for beginners. Greens had a lot of rough spots in them that need to be repaired. (not ball marks but spots where the green is ate up and needs to be repaired professionally. Not worth 50.00. I would find another course if u are playing 50.00 or pay a little more for a nicer course. Beachwood Golf Course is one of the oldest golf courses in North Myrtle Beach, nestled between the Intracoastal Waterway and Highway 17.